Boqueron: After our rides to Mayaguez to check into the country, we were ready for some well-deserved rest. The following day, we explored the little town with its quiet streets, empty food stalls (full of scallops during the weekend), friendly people and working high speed internet! Boqueron would become our favourite place along the South Coast, but that might have to do with the feeling of finally being back in civilization with all its conveniences, mixed with the relaxed atmosphere of a Latin American country. The town is clean, the bay calm and pretty. The park with palm trees and a big, yellow beach is attractive, but … dogs are not allowed. We realized later that Puerto Rico is not the greatest place for our “kids”. Stray dogs are aggressive, most beaches don’t allow dogs and in Ponce, we almost got a fine for not having muzzles on Kali and Darwin while walking them, on leash, through a pedestrian zone! 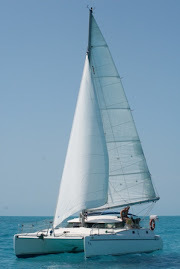 Cabo Rojo: The motor trip continued, since we were still headed into the wind. Before we rounded the cape on the south western corner of Puerto Rico, we saw a cute lighthouse on the top of a cliff and decided we were not in a hurry to get to La Parguera, our next destination. We knew going east would be slow and a bit uncomfortable as it was, but we also wanted to see a few things along the way. After a hot hike to the top of the cliff, where the lighthouse and a great view awaited, we found a surprisingly packed white beach in a pretty cove. Our dip in the clear water was very refreshing – it surely had been a while- and all four of us enjoyed the stop. 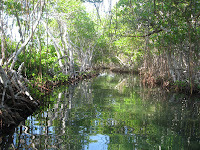 La Parguera: A lot of people rave about this town in the mangroves. We have no idea why… Everything on land is built in and out and on concrete. No grass to be found, let alone a beach. 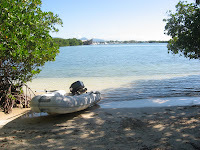 Mark and I explored different bays with our dinghy and followed a canal with a natural roof of mangroves, which was pretty cool. Some of the wooden houses on the water stand on stilts and are colourful. Very cute! We also did a little tour to a bioluminescent bay, but were not impressed. There is a lot of light pollution. Our experiences with the phosphorescent water in Luperon were more special. Weather kept us there for a couple of days, but right after that, we moved on. Gilligan’s Island: We got pretty lucky with the benign winds while we travelled along the coast. Once again, for each leg, we needed to leave in the dark, to reach our next destination before the wind would pick up in early morning. On calm days, we decided to travel during the day without being beaten up too badly. One of those days, we arrived near Gilligan’s Island in the afternoon. The attraction there is a clear lagoon in the mangroves. It is located in a National Park (no dogs allowed). When Mark and I checked it out, the prettiness was lost because of the dark clouds overhead. Ponce: The anchorage in Ponce is nothing special. The water is deep; the shallower spots are taken by private mooring balls. The surroundings of the bay are industrial on one side, private on the other side with the Yacht Club, and a wooden board walk with kiosks on the third side. This area is busy during the weekends and quiet on other days. A lot of police is present any time. This is also the area where we could leave our dinghy at a public boat ramp. We had to walk passed the board walk to get to a run down public beach area, where at last, the dogs could run freely. 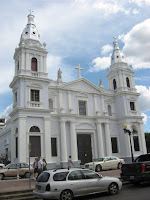 The main reason we stopped in Ponce was to pick up a few packages and to rent a car to do grocery shopping and boat provisioning. The day we rented the car, we sneaked a short visit to the historic center in. 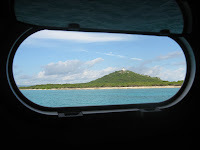 Isla Cajo de Muertos: This island on the way to Salinas has a gorgeous Bahama-like anchorage. We spent the night in beautiful blue and clear water, while we looked out over a lighthouse and an arid, deserted island. I walked the tricky and prickly trail, lined with brush and huge cacti, up the hill, where the neglected lighthouse was situated. Mark stayed low key on the beach. If we would have known no rangers resided on the island, we could have taken the dogs with us on the hike, because, of course, no dogs were allowed on the island. Salinas: The best hurricane hole in Puerto Rico is near here. 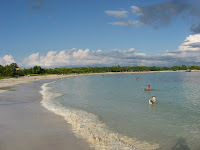 The bay next to Playa Salinas is also very protected and inhabited by manatees. We weren’t lucky enough to see these mellow clumsy creatures yet, but got a glimpse of them in our next anchorage. Salinas didn’t do it for us, either. People are still very friendly and we are very grateful that the marina lets cruisers use the dinghy dock, water and garbage cans. 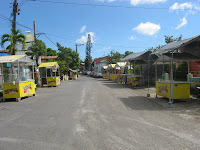 The real town is a bit of a walk and that’s were the post office and the big grocery store are located. Before we came to Puerto Rico, we expected it to be not too different than an American State. The postal system is the same, so it would be easy for us to order stuff online and pick it up. We thought! The hassle we had to go through to deal with all the packages was huge. Orders were sent to the wrong address, got delayed, weren’t allowed to be forwarded, were back ordered, or got sent the wrong way even though we requested them to go USPS (of course we didn’t have an address for all those FedEx and UPS packages), which caused us most of the trouble. It was a frustrating mess and might have to do with our less than happy moods while dealing with all this for a month. On top of that, we didn’t have a phone to call and check in on statuses or to fix the problems. We tried to get Mark’s American phone to work, but even that turned into a three week endeavour with no luck so we gave up. Punta Patillas: The trips from Salinas on were tricky and caused contradiction. We needed to leave in the dark to make progress, but… fish traps with floats on the water surface were spread all over the place. We needed enough light to be able to see and avoid them. Even then, they were hard to see because of the choppy seas. Since spotting them a few times unexpectedly, we never left before day break anymore. Our last stop on the South Coast, was the clear bay at Punta Patillas. We took advantage of the visibility of the water, to scrub the bottom of our boat once more. The amount of crap that had collected again was unbelievable! We also noticed a big chunk was missing out of one propeller and the other one was deteriorating as well. 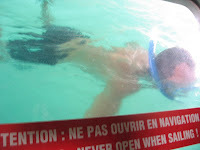 Our list of stuff to do on the boat was still growing! We counted on doing a lot of work on Irie, so it was no surprise that our visit to Puerto Rico would be one of pleasure ánd work. How much work, would become clear, once we anchored on the East Coast of the country.